I planning to buy new wacom for replacing my old one which is small intuos 4. I aim for wacom intous pro but I'm confused which size should I buy. The thing I'm confused is that do the size of medium and large have lmpact gap on drawing precision? My monitor size is 22" and screen res 1080 by the way. My personal experience is that the large size is great, especially if you're like me and have duel monitors. In reality though, I don't think the sizes really have major impacts on the drawing precision. Because the large tablet screen space is basically A4 sized, you do have to use your elbow and shoulder in the drawings, just not flicking your wrist. My advice is definitely not large :D Being into hard surface I have to draw a ton of strait lines, so the bigger the tablet the harder it is to make a good strait like. If i try to fix this by zooming out, usually my lines get crazy pixelized and its impossible to see what you are doing. Also if you need to zoom on the piece to work on some area you would need to move your arm around like crazy on that big tablet and it might be exhausting. I tried Bamboo and then Intuos medium, and had a lot easier time with lineart and control overall with Intuos Medium. I just love my Intuos medium! Never really tried large so can't say anything about it. So after some searching, I saw new intuos pro pth 660 just released recently. But the problem is I saw some complain about it and some say it is good. Is it actually worth to buy that one? What's you guys thought about it? Wich complain you saw? I dint hear of any about the Intuos Pro. I should defenatly buy the pro one because of the new pen. So much more sensitive in the low pressure spectrum. Its all about the scale relationship of what you draw and see. Its pointless to talk small, medium, big without saying it with the monitor size. 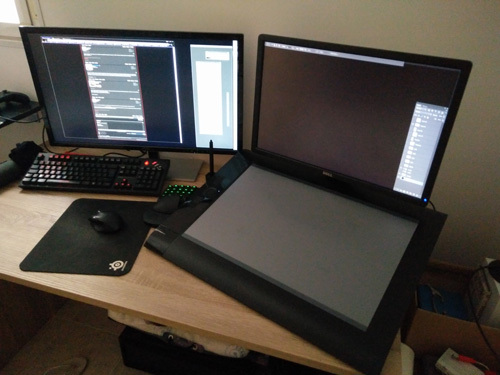 In your case an intuos medium on a 22 inch will be roughly 1:2 What you see will be double of what you draw. You can draw 1:1 or 1:1.5 or 1:2 or 1:3 beyond that I think starts to get crazy. I myself, can switch from 1:1 to a 1:2 and in a phew minutes im feeling comfortable enough. In general If you want to draw from shoulder you want the bigger the better tablet. While Im pretty happy with it I dont advise it. They dont build xl anymore and that thing is really cumbersome to have it around. At the end isnt going to matter much. If you can control the line on 1:1 you will do so in a 1:3 and if you can draw/paint 1:1 you will be able to doit 1:3. Im pretty sure 90% if not more of the digital art is done on medium or even smaller size. One important thing semi offtopic. BE VERY CAREFUL that your monitor has a square pixel density. MANY MANY monitors in general the wider ones dont have the same vertical to horizontal pixel density and they stretch the image. Best way to check it is to draw a perfect square with marque tool and measure it on your monitor to check that the sizes are the same lenght. You dont want to be drawing something and seeing a streched version of it. But yeah, assuming you reaally need it to be wacom and you do prefer traditional tablets I'd go with the medium, I find it easier to coordinate when making smaller movements. So I wanted to know if others have good experience with this intuos pro 2017.